Grant Millington, praised by Castleford head coach Daryl Powell. 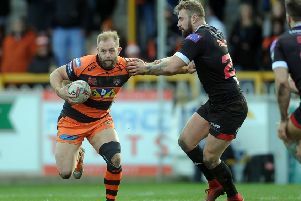 Castleford Tigers head coach Daryl Powell reckons his side will learn some valuable lessons from their 28-0 defeat to Wigan Warriors played out in wet conditions at the DW Stadium. The result flattered Wigan, who scored three tries in the final 16 minutes to finally see off the battling Tigers, but it was the second time this season that Cas had been nilled in a Super League game. “It was always going to be a tough game at Wigan,” said Powell. “We didn’t get anything out of it, but the boys worked really hard. “I didn’t think the score reflected the effort and determination that we showed, but sometimes that happens. “They were tough conditions, but the same for both sides. It was really slippy and it belted it down pretty much all day over there so it was difficult for a game of rugby league to be played in. “Obviously it’s never great when you don’t get any points. “We created a couple of chances, but not many because Wigan defended really well. We had a smarter kick that we should have done a little bit better with in the first half and then Michael Channing went close in the second, but it was heavy going and really difficult to carve out opportunities. Powell was pleased with the display of a couple of his forwards in particular and praised the rest of the players for the way they tried on a night when nothing would quite come off. He added: “I thought Ryan Bailey was really good. He took us forward, he got two-man tackles and won us some penalties. Generally he was really good all night. “Grant Millington came off the bench and sparked us up a bit with his carries. “Everybody worked really hard, but it was a tough game to get anything out of. “I thought the players worked exceptionally hard and defended really well for large periods. Wigan took their opportunities and kicked three penalty goals. “I thought the refereeing was a little bit unbalanced. There was a lot of guess work going on in the game, but I’m not blaming anybody. It was one of those games that we didn’t get right at times in wet conditions.